Hyatt Gold Passport Giving Diamond Status For Credit Card Holders? 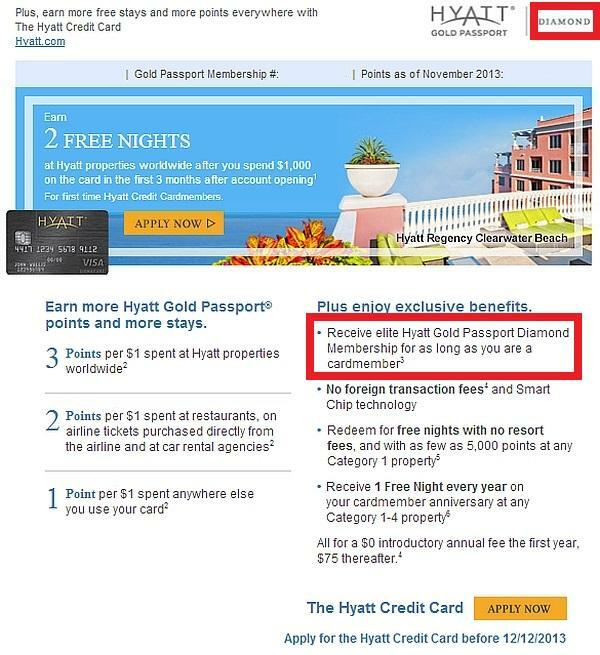 LoyaltyLobby reader just forwarded me a copy of the email that he had received from Hyatt pushing the credit card sign up. I have not covered credit card related issues, although do receive reader email about them often. Couldn’t take a pass on this one, however. Seems that Hyatt is now giving a Diamond level membership for some that apply and get approved for the product. The member that received this offer is already a Diamond, but would have use for easier way to keep the status. 3 Diamond status valid as long as your Hyatt Credit Card is open and not in default and you comply with Hyatt Gold Passport program rules. Authorized users will not be eligible for Diamond status or associated Diamond benefits. Edit: There are some comments that imply that the offer above would have been photoshopped to include the Diamond status. I have only removed the name of the recipient of this email, his Gold Passport account number and balance. The email that the reader sent me resolved to Hyatt’s own web site, where the above screenshot was then taken. When someone forwards me an email offer that they have received from any of the programs, I always remove any identifiable info. You wouldn’t like to have your name, account number and email address to be out the on the open internet, right? It would be irresponsible for me to include info such as this. I had second look at the personalized link and cleaned the name, account number and balance. You can access this offer on Hyatt’s website here. Has Hyatt finally completely lost it, if they are giving away Diamond status for merely being a Hyatt/Chase credit card holder? It is not uncommon for programs to give a mid-level status for credit card holders, but this would be quite unprecedented. Could be that this is targeted for those Gold Passport members that are already Diamond members and could bother less about the Platinum benefit that usually comes with the card.